“Taking into account all of the different activities and missions that are specifically searching for evidence of alien life, we are on the verge of making one of the most profound, unprecedented, discoveries in history,” said Thomas Zurbuchen, associate administrator for the Science Mission Directorate during the recent congressional hearing of the committee on ‘Advances in the Search for Life,’ on April 29th. Zurbuchen reported that NASA’s recent advances, such as the discovery of hydrogen in Saturn’s moon Enceladus and the Hubble team’s promising results from the oceans of Jupiter’s moon, Europa, are promising signs that we’re closer than ever to discovering evidence of alien life. Zurbuchen has been involved with several NASA science missions — Ulysses, the MESSENGER spacecraft to Mercury, and the Advanced Composition Explorer (ACE). “Now, with NASA missions like the Kepler and Spitzer Space Telescopes, we have discovered more than 3,400 exoplanets,with billions more just waiting to be revealed in our galaxy alone. This February, NASA’s Spitzer Space Telescope team announced the discovery of seven Earthsizedplanets, the most ever, found around a single star, called TRAPPIST-1. Three of theseplanets are firmly located in the habitable zone, the area around the parent star where a rocky planet is most likely to have liquid water. This system of seven rocky worlds – all of them with the potential for water, a key to life as we know it – is an exciting discovery in the search for life on other worlds. “The TRAPPIST-1 system is just 39 light years away and its discovery tells us that there is plenty of planet making material in our little corner of the solar system, indicating that finding Earth-like planets may actually be closer to us than we originally thought. Future study of this planetary system could reveal conditions suitable for life. Since the initial observations, the follow-on findings for TRAPPIST-1 (and exoplanets in general) are occurring almost weekly, but the best is yet to come. Image credits: On May 2, 2016, scientists announced the discovery of TRAPPIST-1, an alien solar system 40 light-years from Earth with a tiny, ultracool dwarf star and three small exoplanets that just might be habitable. This is NASA artist’s view of the TRAPPIST-1 star system above as seen from near one of the three alien planets circling their dim parent star. NASA’s Spitzer, Hubble, and Kepler Space Telescopes will continue to help astronomers plan for such follow-up studies using NASA’s upcoming James Webb Space Telescope, launching in 2018. With much greater sensitivity, Webb will be able to detect the chemical fingerprints of water, methane, oxygen, ozone, and other components of a planet’s atmosphere. Webb also will analyze planets’ temperatures and surface pressures – key factors in assessing their habitability. “The Transiting Exoplanet Survey Satellite (TESS) mission will also launch next year, to survey the entire sky for nearby exoplanets, and the Wide Field Infrared Survey Telescope (WFIRST), launching in the mid-2020s, will directly image exoplanets and study their atmospheric chemistry for the first time using reflected light from their stars. 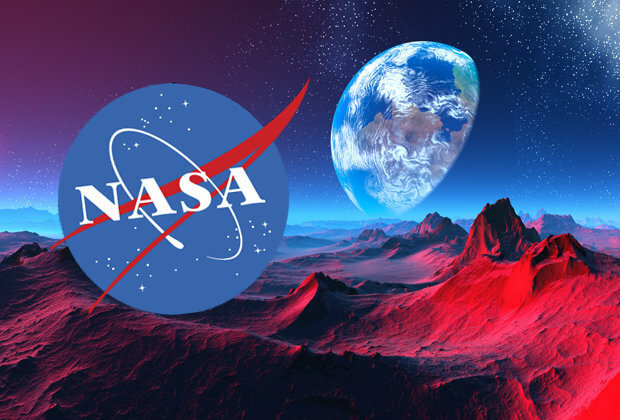 “NASA is studying mission concepts even beyond these near-term missions for the 2030s that would further explore and characterize the bounty of possible habitable Earth-like planets. These mission concepts include the Habitable Exoplanet Imaging Mission and the Large Ultraviolet/Visible/Infrared Surveyor, which would operate from the ultraviolet to the near-infrared like Hubble and WFIRST, and the Origins Space Telescope, which would operate from the mid-infrared to the far infrared like the James Webb telescope. Above is the video of the April 29th hearing. Fast forward to 22:00. The hearing will surveyed recent breakthroughs in a variety of fields that contribute to astrobiology, such as the continued discovery of exoplanets and research efforts to understand life’s origin on Earth and in the lab.